Summary of today’s show: Msgr. John McLaughlin has seen a wide variety assignments as a priest of the Archdiocese: urban parish, suburban parish, a parish that includes the New England Patriots, first vocation director for the Archdiocese of the Military Services, now priest-chaplain for campus ministry at Boston University, and the first new monsignor the Archdiocese of Boston has seen in years. Msgr. McLaughlin joins Scot Landry and his old friend Fr. Chris O’Connor for a laughter-filled hour in which the monsignor tells his fascinating story of ministry to young people that took so many different forms. 1st segment: Scot welcomed everyone and discussed preparing for Independence Day and the final day of the Fortnight for Freedom. Scot said to Fr. Chris that last weekend we had an ordination of a man to the transitional diaconate. Fr. Chris said Deacon Tom McDonald was ordained at St. John Seminary. He’s been studying in Rome and just came back. He now declares ordination season is over until September when they will ordain some permanent deacons. Fr. Chris said Tom wanted to be ordained here now instead of in St. Peter’s in Rome in October mainly so that more of his family and friends could attend. Other men have made the same decision for similar reasons. They also have an another summer in order to carry out the duties of deacons, baptizing, marrying, and their other roles. Deacon Tom has been assigned to St. Paul’s in Cambridge for the summer. Today’s guest is Msgr. John McLaughlin, who was a military chaplain last year until returning to Boston to become chaplain at Boston University’s Catholic Center. 2nd segment: Scot noted that Msgr. McLaughlin wants to be called Father. He asked about his background. He grew up in St. Anthony’s parish in Woburn and when he was ordained he was the sixth man from that parish in six years and three of them were ordained at the same time. Fr. John thinks it was a coincidence that three were all together. He said Woburn is a good, close, faith-filled community that produces many vocations. He was about 30 years old when he started thinking about the priesthood. He had worked for 10 years after graduating Boston College. He was also coaching Woburn high school wrestling when a car accident killed some of his young men and injured to hers, working with them made him look at life a different way. He also traveled to Medjugorje with one of the men. He went there in 1989 for the first time. (It was reported that children were seeing the Blessed Mother.) There were 250,000 were in the little Bosnian village of about 3,000, where people prayed and sang about their faith very openly. It made him re-think his life. Later, after his second trip in 1990, he went to talk to the vocations director. Scot asked if it was a surprise to him that God might be calling him to the priesthood. Before the accident Fr. John never would have thought about it and it was a surprise to friends, family, and co-workers too. Scot asked how it was returning to college after 10 years out. Fr. John said the most difficult adjustment was moving out of his own house into a small room without a phone or a bathroom of his own. Fr. John said their class was about 18 ordained together, plus another 30 from other dioceses. He said they had a lot of fun. Scot said the class of 1995 was the largest in a lot of time. Fr. John said after ordination he went to St. Clements in Somerville for 5 years and then after that to St. Mary’s in Foxboro, which was so different. He was there for 5 years. While he was there he started LifeTeen there. They had 1,800 kids in religious education. Scot asked what it was like on Patriots Sundays in the fall. Fr. John said they had very large 4pm crowds. The Patriots won three Super Bowls while Fr. John was there. He also blessed the stadium 10 times and the Patriots never lost when he blessed the stadium. Fr. Chris said he once celebrated Mass for a visiting team. Fr. John then moved to St. Monica in Methuen for three years as pastor. It went very well. It’s a very large parish. They started LifeTeen there as well, and they have one seminarian from that who will be ordained next year. Fr. John said when you go to a parish, you don’t often see teens, although you see all other ages. He’d learned about LifeTeen and recognizing that there wasn’t a lot in the Church to bring in teens, he wanted to do that. It’s not perfect, but it is Eucharist-centered. The results were phenomenal. The kids loved coming. Scot asked if LifeTeen is a lot of work for the pastor and parish. Fr. John said it’s a lot of work and there is a financial aspect as well. There’s an evening Mass on Sunday plus the Life Night after. There’s a need for good music for the kids with a particular kind of band. From parish ministry, Fr. John was assigned to the Archdiocese of Military Services. Fr. John recalled getting a call one night asking him if he wanted to be the vocations director for the Archdiocese of the Military. He wasn’t sure at first about leaving St. Monica’s so early. Later on he found out that Cardinal O’Brien who was Archbishop for the Military Services had known Fr. John in Rome and recommended him. Archbishop Broglio, he followed Archbishop O’Brien, eventually signed him up for the job. Fr. John said he went to Washington, DC, where he had to figure out what to do as the first vocation director of the military. The archdiocese of the military is all over the world, so he relied heavily on the chaplains of the different military services. They understood that they had to be proactive in finding replacements for themselves in the priesthood. Fr. John said there was a great fraternity among chaplains. Boston has always ranked among the top three dioceses in giving chaplains to the military. He said spent a lot of time getting to know all the chaplains on retreats or convocations. Scot pointed out that Fr. John wasn’t in the military but was working for the military archdiocese. Scot asked if there seems to be an affinity for the priesthood among particular services. Fr. John said he was never in the military so he didn’t focus on one more than the others. He did note that the Marine Corps has more Catholics than any other branch, but overall the seminarians were spread out among the branches. He once did an interview with EWTN on the Fourth of July. He got a call the next day from a young Marine, a Major helicopter pilot stationed in Cherry Point, N.C. The man had some doubts, but Fr. John pointed out that he was already living and acting in a priestly way. He told the man that he was acting like he couldn’t handle the truth. The major called him back in the middle of the night and agreed. He was the first man he recruited. Fr. Chris asked what the Archdiocese of the Military is. Fr. John said it’s like the pastoral center in Boston: It takes care of the records of sacraments, it has a tribunal, takes care of the canonical and sacramental needs of chaplains. Archbishop Broglio traveled the world for confirmations and the like. He was archbishop for Army, Navy, Air Force, Marines, and Coast Guard. Scot said in the military service Fr. John wasn’t recruiting men to become military chaplains, but to help dioceses get new seminarians because he had access to so may young men who could have vocations. Fr. John said it started because a study showed that 10 percent of the men in the seminaries had military experience so they thought there might be more. The Military Archdiocese doesn’t have priests itself. They are all lended from dioceses. 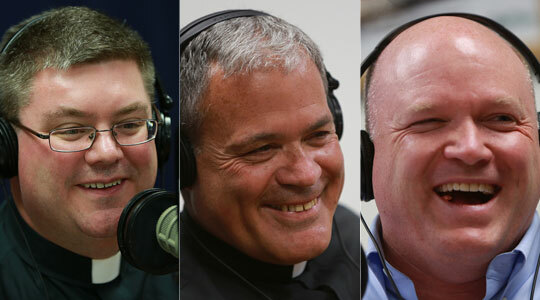 If the men he recruited want to be chaplains, they would be co-sponsored–each diocese paying half–and after ordination they would be in the diocese for three to five years and then go to the chaplains, where they could serve up to 25 years. Fr. John said he always tried to keep the men in the dioceses where they were from in order to be closely connected to their family and friends for life. But there are men who come from military families who have no home, so he worked with them to find a bishop who was open to the chaplains corp. He said they brought in 40 vocations over three years, including a couple into religious orders. They were able to send a seminarian to the Capuchins and one to Boston. He did that for three years and then came back to Boston to become campus minister at Boston University. He had been expecting to come back as a pastor. As a Boston College grad, he thought it was a joke at first. But the kids are great, a wonderful group of young people. Fr. John said he hasn’t had any kids from his old parishes at BU yet. As the priest-chaplain at BU, there’s no real typical day, especially when working with young people. There are money problems, family problems, problems with roommates, etc. He celebrates Mass and hears many confessions. They run five retreats per year, including two graduate retreats. They have Fellowship of Catholic University Students who run Bible studies. FOCUS are young people who are missionaries who come to campus to reach out to other young Catholics and teach them the faith, so when they go out they can instruct others. Scot recommended listeners to listen to last Wednesday’s show on FOCUS. Scot said last year the campus ministry team at BU turned over completely. Mother Olga had been there several years and the Brotherhood of Hope even longer. Fr. John said it was a difficult change for the students and for him, especially since he’s not done college ministry. He has to do fundraising for the program now. Also, the students are up very late every night, past midnight, and doesn’t usually get to bed past 1 or 2am. He lives in East Boston at Sacred Heart Parish with Fr. Wayne Belschner. They have three Masses on Sundays, 12 noon, 6pm, and 10pm. He likes being with young people filled with hope with a positive outlook on life. It’s exciting to be with them at this time as they prepare for life. Scot asked what it’s like being a priest at a secular college in the city. BU is the fourth largest private school in the country and is 40% Catholic. They have 30,000 or 40,000 students total. Cardinal Seán calls it the largest Catholic school in Boston. Fr. John said they have a lot of weddings of graduates who come back to Marsh Chapel. Fr. Chris filled in for Fr. John at a wedding last weekend. Fr. John said they are grateful to be able to use Marsh Chapel, which was a Methodist chapel, and Boston University lets them have Mass there. The Catholic Center is a four-story brownstone owned by the Archdiocese of Boston on Granby Street. For Mass on weekends, they see 700 to 1,000 students. They have anywhere from 30 to a few hundred people in the building daily. They do spaghetti suppers on Tuesday open for anyone on campus where they feed several hundred. After the supper they do something called Spirit Night Live. Other times in the week they have adoration that is well attended. Scot asked what activities besides Mass helps the kids go deeper in their faith. Fr. John said Adoration is very powerful in the kids and the students are serious about. They also get 90+ at the retreats and they plan it all themselves. Fr. John congratulated Camille, one of his interns, on getting engaged to Danny Menardi and they will be married next year. They have also had two BU alum ordained in recent years and there are several alums in the seminary right now. Scot asked Fr. John for his hopes as he goes into his second year. Fr. John said they are looking at a new retreat site, Camp Fatima in Gilhmanton, NH, which they hope will give them some new opportunities. They will do the undergrad and grad retreats at the same time there while keeping them separate. They will also be purchasing breviaries – if anyone would like to contribute to Catholic Center, 211 Bay State Road, Boston, MA for the breviaries–for use by the students. They plan to start doing the Liturgy of the Hours with the students during the school year. Scot suggested that people could support the work of the Catholic Center, which gets only about half its budget from the Catholic Appeal.